*** This hat can be made with or without cordlocks, it has detailed instructions for adding a cordlock to your hat for full adjustability! *** You can sew it with the contrasting band or without. This is a pattern for a custom tieback scrub hat. 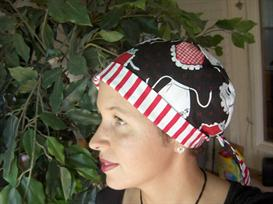 This is the ladies version of a men's tieback hat, it is larger, roomier, and more feminine. This hat is a roomy ties in back style for full, comfy coverage. If you are making this hat to wear after chemo or radiation treatments I would suggest cutting with pinking shears so you do not have to serge or zig zag stitch the inside seams, it is better on sensitive skin. 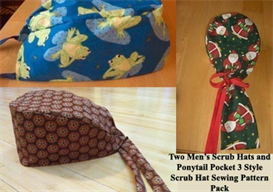 You can make two hats from 1 yard of fabric. The instructions and patterns include over 25 colored pictures to guide you through each step. 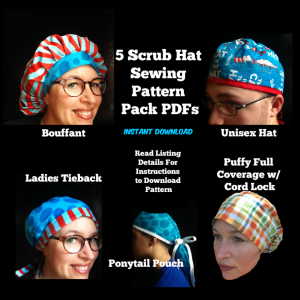 There are detailed written instructions in the PDF file and tons of pictures taken while I sewed the hat so that you don't have to guess at what the instructions are trying to say.Just print on regular printer paper and join the pattern pages as instructed and you are all set. 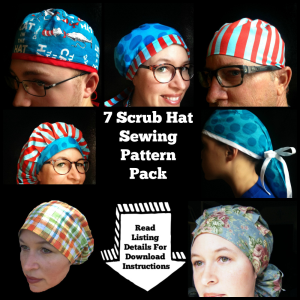 This is a sewing pattern you will recieve a download email for within 24 hours of payment. If you have any problems with download contact me immedietly and let me know.